I’ve spent most of the past week digging through mountains of data from the Taiwan Election and Democratization Surveys (TEDS) trying to put together a paper proposal for a conference later this year. As a side effect, I have lots of stuff to share on my blog. 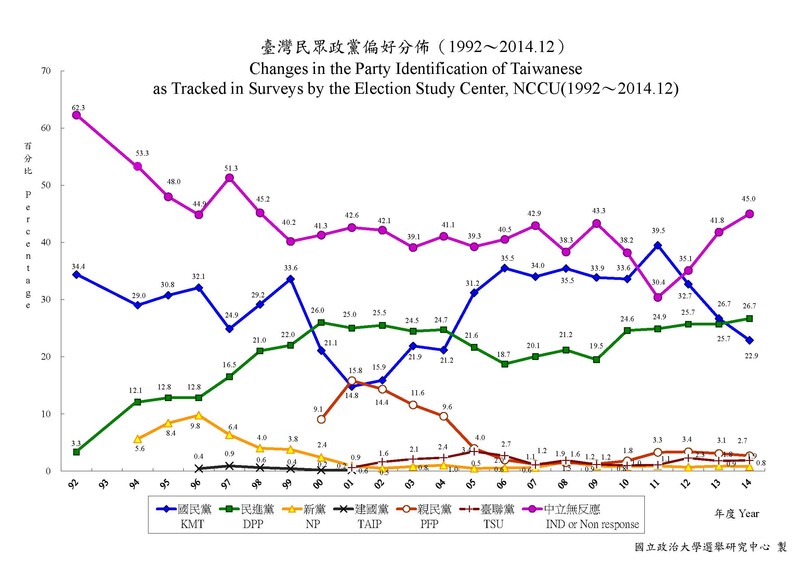 After last year’s elections, I lamented that we would never be able to completely figure out what happened in the two most important elections, New Taipei and Taoyuan, since TEDS was doing the big post-election face-to-face surveys in Taipei, Taichung, and Kaohsiung. Happily, I was wrong. In addition to the major surveys (which will be released in the next few weeks), TEDS also did pre-election telephone surveys in New Taipei, Taoyuan, Yilan, and Yunlin. Even better, TEDS has conducted national surveys quarterly since September 2012. As a result, there is a lot of stuff to dig through, and I might be able to come up with a more complete answer for why the KMT lost Taoyuan and barely won New Taipei. Blue supporters are mostly ignoring last year’s elections. They don’t matter. They were local, not national elections. People just wanted to express dissatisfaction with President Ma, but they’ll come back to the KMT in national elections when it really matters. The KMT had lousy candidates. Whatever the reason, I keep talking to KMT true believers who think the KMT is in good shape for next year’s elections. They aren’t convinced that Hung Hsiu-chu can’t beat Tsai Ing-wen, to say nothing of the possibility that the KMT will lose the legislature. Those objections are a little correct, but they are mostly wrong. Local elections are a bit different, but mayoral elections still run largely along party lines. The bigger the city or county, the more nationalized the election is. Hualien and Hsinchu County had weird, local things happen, but that type of thing is a lot less likely in a direct municipality. 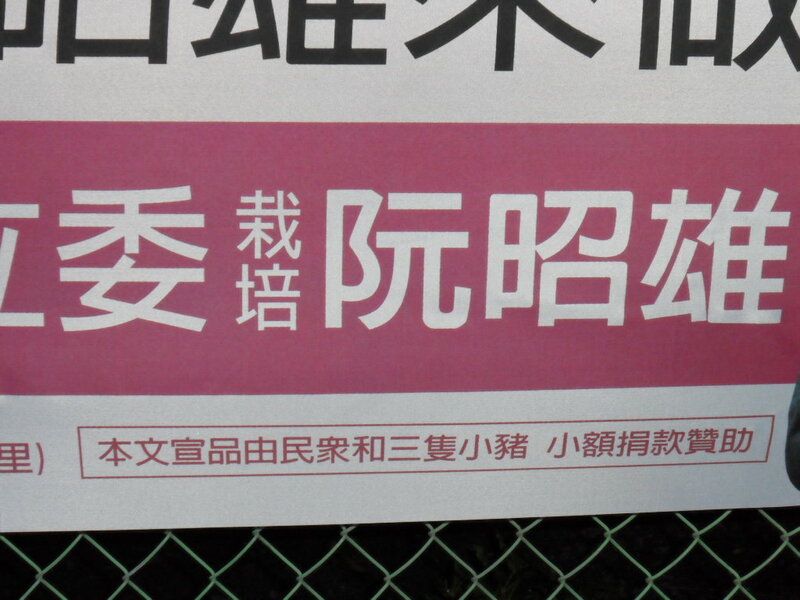 Sean Lien was a historically awful candidate in Taipei City, and he managed to single-handedly lose that race. 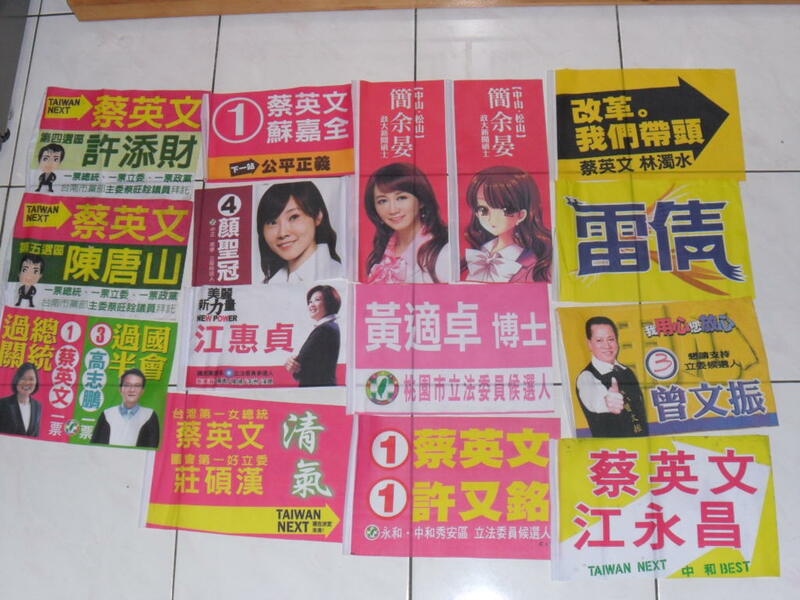 However, the KMT candidates in Taoyuan and New Taipei were both more highly rated than their DPP opponents. Candidate quality can’t explain the poor KMT performance in those races. Then there is party ID, which is what I’m really going to write about today. To put it bluntly, the KMT has suffered a massive decline in its party ID over the last four years, and party ID is one of the most important variables in all of political science. You can see this decline in data from TISR and the Election Study Center, NCCU, pictured below. From the late 1990s until 2012, party ID was fairly stable. The blue camp, mostly the KMT, had a consistent lead of about 5-10 points over the green camp, mostly the DPP. Not coincidentally, the blue camp consistently had about a 10% edge in most elections. In hindsight, the 2012 election might be both the most “typical” election result and also the last election of that party system. A quick review. Party identification has two classic conceptualizations. The social psychologists of the Michigan School thought of party ID as a group identity. Someone would identify themselves as a Democrat in the same way they would identify themselves as a Catholic, a German, a Red Sox fan, or a union member. All of those identities define who the person is, so Democratic identifiers usually vote for Democratic candidates because they are both part of the same meaningful group. A person who ceases to identify as a Democrat is telling you something very substantive and meaningful about how he or she has changed. The other way to conceptualize party ID is as a running tally. This idea has its roots in the rational choice school of thought that comes out of microeconomics. According to this school, every time something happens, a voter updates his or her current opinion of the party. If something negative happens, the voter’s opinion is lowered. This running tally is then a summary of how the voter currently sees the party, and it is a good information shortcut to use in the voting decision. In Taiwan, party ID is usually operationalized as asking the voter, among parties A, B, C, D, and E, which party do you support more? A long list of studies over the past twenty-five years have shown that party ID is a powerful indicator of vote choice in Taiwan, just as in the rest of the world. Here is the TEDS party ID data for the past four years. The first data point is from rolling telephone surveys in the five weeks before the 2012 election. The second data point is from the post-election face-to-face survey, which was mostly conducted during the month after the election. The remaining data points are the quarterly telephone surveys. The surveys before and after the 2012 had large samples (n~5000, 2000), which the quarterly surveys had about 1000 interviews each. In some of the following graphs in which the data are cut into several categories, the quarterly data will jump around a bit more, reflecting the larger sampling error. The DPP held steady at around 25% through most of the period, but it has been above 30% in the two most recent quarters. Of course, the December 2014 data are critical, since they were taken right after the election. 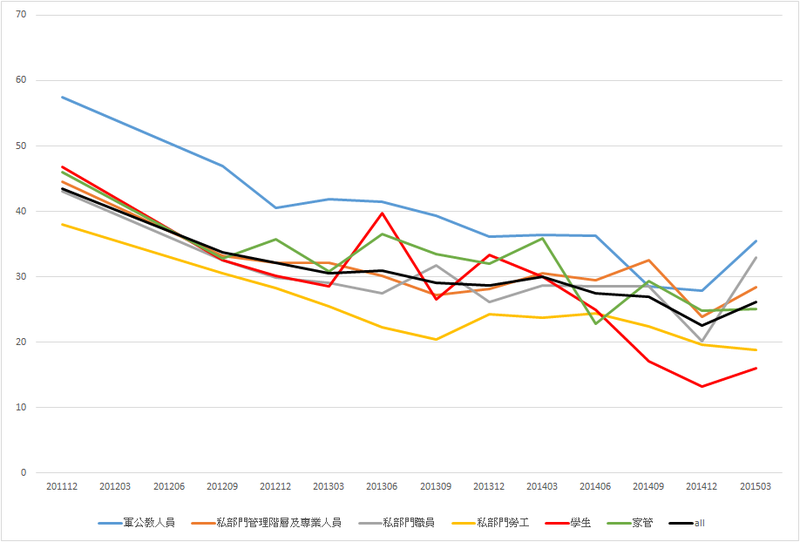 The KMT data is more dramatic. KMT party ID had a spike up from its normal 35% or so right before and after the 2012 election. By the time the quarterly data start in Sept 2009, this spike is completely gone. The KMT continues to bleed support, with a noticeable plunge in Dec 2014. Comparing the two elections, the KMT crashed from 43% in late 2011 to 23% in late 2014. Occupation is not quite uniform. KMT support among government employees (the blue line) declines at a slightly steeper slope. The red line for students is just about at the average until the June 2014 survey, when it plunges dramatically. It is as if a generation of students were radicalized or something! Statistically speaking, my model showed that the slope of the student’s line was more negative than that for the government employees. However, since students are a small group, their coefficient was not statistically significant. There is one more demographic variable that I find intriguing. I recoded all the townships into four categories. The first is the “urban core.” This includes all the prosperous parts of the major cities. The second is the “urban sprawl.” This includes the decaying downtown sections as well as the new growth overflow suburbs. Most of New Taipei and Taoyuan are in this second category. If money were no object, almost everyone would choose to live in the posh first category rather than the (comparatively) low-rent second category. The third category includes rural Min-nan townships. This category is dominated by the stretch of townships in the rural south from Changhua to Pingtung. The fourth category is much smaller and includes all the other rural townships. This group is dominated by predominantly Hakka townships, though it also includes a large number of (sparely populated) Aboriginal townships. There lines are different, especially if you limit the sample to the period from Sept 2012 to Dec 2014, as my model did. Support for the KMT among people in the rural diverse townships did not decline much at all. This is similar to the trend among Hakkas that we saw above, but it is even stronger here. 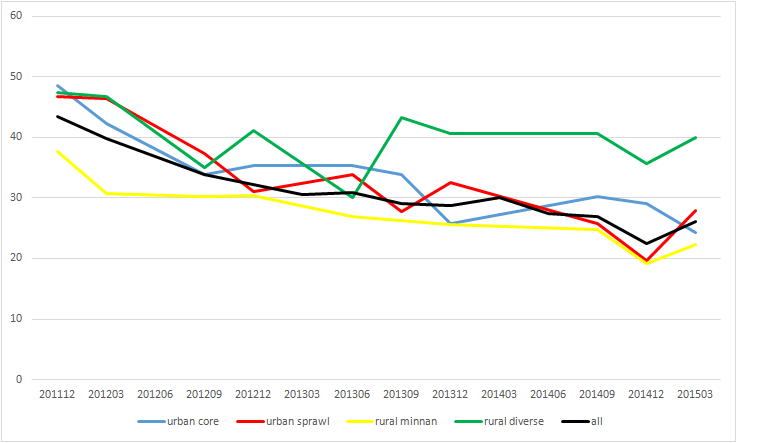 It is possible that preferences among rural Hakkas have been more stable than those among urban Hakkas (though I haven’t tested that idea). The bad news for the KMT is that their best group is by far the smallest. The largest category is group 2, the urban sprawl. In this group, support for the KMT plunged the fastest. It’s hard to see in this picture, but the difference is statistically significant. TEDS telephone surveys don’t ask respondents for income information since that is too sensitive to do on the phone, but an obvious interpretation is that poorer urbanites are abandoning the KMT ship faster. This might be evidence of the emerging class cleavage. The variations among subgroups are interesting, but the main takeaway point from this post is the main trend. Those big, black lines in the middle of each graph are moving relentlessly downward. The KMT can tell itself that this doesn’t matter. All those newly undecided voters will come back to the KMT when national power is at stake. That’s what the DPP told itself in 2007. That didn’t work out so well for the DPP, and the dip in DPP party ID in Chen’s second term was much smaller than the dip in KMT party ID during Ma’s second term. 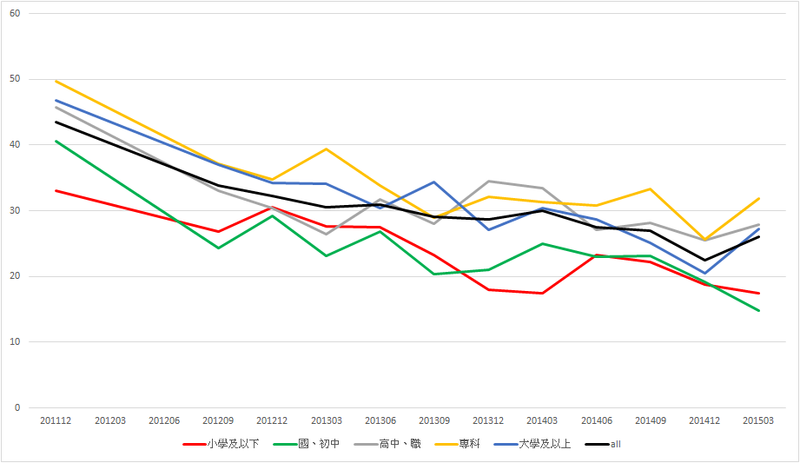 Whether people are no longer expressing a group identity with the KMT or their running tallies no longer put the KMT in a favorable position, this drop in KMT party ID is almost certainly the main cause of the KMT’s 2014 debacle (outside of Taipei). Unless things turn around in a big way, it is also almost certain to have a major impact six months from now. In the last week before the election, all signs point to a good election night for the DPP. This should be their best local election since the 1997 landslide. Since that particular election is burned vividly into my memory, I thought I’d go back and look at a couple of things that have changed since then. In particular, I want to discuss (1) geography and how the political map has changed (2) the way that money politics is different today than a generation ago. In 1997, the DPP’s victory was almost unbelievable in geographic scope. Taipei and Kaohsiung Cities were not up for election, but all the other cities and counties were. The DPP won nearly every major race. In the south, the DPP held power in Kaoshiung County and Tainan County, they took back power in Pingtung, won a messy four-way race in Tainan City, and their ally, Chang Po-ya 張博雅(now the head of the Control Yuan) won a fifth consecutive term for the Hsu family dynasty in Chiayi City. In the north, the DPP easily retained power in Yilan County, won a tough three-way race in Hsinchu County, somehow held Taoyuan County (where Annette Lu 呂秀蓮 had won the office in a by-election a year earlier), won an outright majority in Hsinchu City, and narrowly edged out the KMT in the biggest prize, Taipei County. The DPP even won in Taichung City and County. They didn’t win in Nantou, but former DPP legislator Peng Pai-hsien 彭百顯 edged out both the DPP and KMT nominees to take that race. It could have been even worse for the KMT. They barely squeezed out victories in Changhua and Yunlin, the two biggest districts they held onto. In terms of numbers of cities and counties that each party won, it didn’t look so bad since the KMT won all the little districts. However, the DPP ended up governing about 80% of Taiwan’s population. Today, that looks a little strange. The KMT’s last redoubt was in Changhua, Yunlin, and Chiayi County. Today, Yunlin and Chiayi usually can be counted on to vote for the DPP, and Changhua is far from a reliable area for either party. Today it would be nearly unthinkable for the DPP to sweep Taoyuan, Hsinchu County, and Hsinchu City. It seemed far less impossible then. The DPP had held the Hsinchu County government since 1989, and it had been very strong in several elections in Hsinchu City during the 1980s. Many of us don’t realize (or can easily forget) just how much the political map has changed. In the 1990s, we didn’t talk so much about the blue north and green south. Rather, the DPP had strength in the north and south, but central Taiwan was often thought of as a “democratic desert.” Perhaps the best way to see the changes is to look at the DPP’s vote in national elections over the years. Ignore the East/Fujian category; it is much smaller than the other five regions. It is also geographically incoherent. In 1994, look at how close the other five regions were to each other. From the weakest to the strongest, the difference was only 10%. Moreover, the north was actually a better region for the DPP than the south. Today that is unthinkable. By 2012, the difference between the weakest and strongest regions had grown to 20%, and the south was about 8% better than the north. 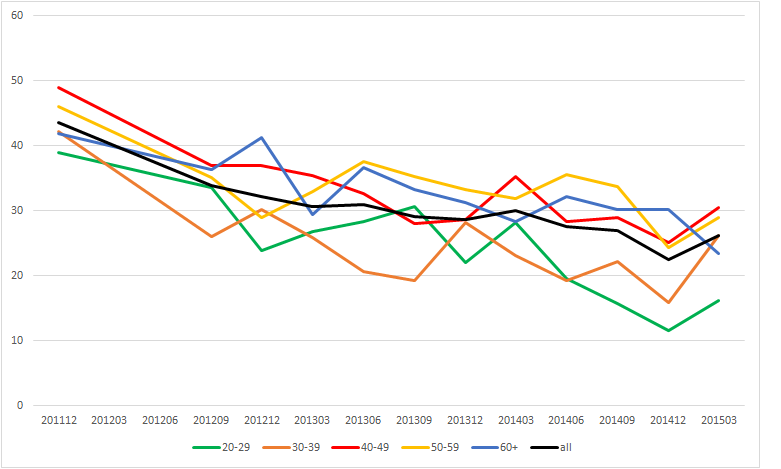 Now look at the difference between 1994 and 2012 for each region. The north has barely changed (+0.5%), the mid-north has slightly increased, the center somewhat more, and the mid-south and south have both increased by a whopping 13%. The DPP’s gains over the past generation have come almost entirely in the southern half of the island. This is what we mean when we talk about the south turning green and the north turning blue. In an absolute sense, the north hasn’t really gotten bluer. However, relative to the national average, the north and mid-north look far bluer than they did a generation ago. The southern half of the island is, of course, much greener. The central region, rather than being a “democratic desert” halfway between DPP bastions in the north and south, has become the bellwether area. As goes the center, so goes Taiwan. You will notice that the mid-south has always been the DPP’s best area in national elections. However, it has not always been the DPP’s best area in local elections. In 1997, when the DPP won nearly everything else, it could not win Yunlin or Chiayi Counties. Somehow the KMT managed to maintain control of local politics in what objectively should have been the DPP’s best area. In the past 20 years, however, the KMT has completely lost this control. This gets me to my second big change in the past generation: money. Money is emerging as a defining issue in current politics, but it runs on a very different logic today than a generation ago. Now we are increasingly aware of the power of large, multinational conglomerates that have extended their reach through every facet of Taiwan’s society. The old picture of an economy dominated by small and medium businesses (with a lot of family businesses) and a large middle class seems less and less accurate as a description of today’s Taiwan. Moreover, almost all businesses have established extensive ties with China. They either do their manufacturing in China, or they want to access China’s enormous domestic market. Because of these ties, economic inequality is increasingly bound together with identity politics. A generation ago, businesses were just starting the move to China, and China itself was far poorer, less powerful, and had a much less aggressive foreign policy. The KMT, headed by Lee Teng-hui, was encouraging a Go-Slow policy for businesses toward China. The USA was still by far Taiwan’s most important market and trading partner. Nevertheless, money in politics was one of the defining issues in the 1997 election. More specifically, the election was all about what voters called black and gold politics. Black referred to organized crime, and during the 1990s organized crime increasingly penetrated local politics. Following the spectacular police crackdowns on organized crime in the late CCK era, crime figures started to run for elected office as a way of gaining legal protection. If a crime boss was in the county assembly and could threaten to cut the local county police budget, the police learned quickly to back off. Minor crime figures ran for township councils, more important ones ran for county assemblies, and the biggest ones ran for the legislature. The ever-increasing presence of organized crime in elected offices led to more and more violence in local politics, larger and more ostentatious brothels and gambling parlors (you couldn’t miss the garish neon lights), and more petty and violent crime. Anger against black and gold politics came to a climax in the summer of 1997 when actress Bai Bing-bing’s 白冰冰 daughter was kidnapped by a gang. The whole country watched on TV as the police incompetently tried to raid their hideout completely unaware that the gang was listening in on the police radio. When the gang killed Bai’s daughter, the nation was outraged. There was a massive protest in Taipei calling only for President Lee to apologize and Premier Lien to resign. A week before the election, the case flared up again when the last gang member stormed the South African embassy and held the Ambassador and his family hostage. Frank Hsieh 謝長廷 emerged the hero by going in to negotiate the gang member’s surrender and coming out with the Ambassador’s baby. When people went to vote the next weekend, black and gold issues were at the front of their considerations. Today, even in local politics, money operates in different ways. On the one hand, if you try to play the traditional game of recycling money through local construction projects, it doesn’t work as well. On the one hand, prosecutors have much better tools for sniffing out corruption and more leeway to pursue those cases in court. On the other hand, the presence of organized crime has diminished considerably. There is much less (visible) prostitution and gambling. Vote buying doesn’t work as well as it used to. Perhaps most importantly, administrative reform in 2010 eliminated local township governments in Taipei, Taichung, Tainan, and Kaohsiung Counties, removing a vital source of cash in many of the most prosperous areas of Taiwan. Of course, building stuff in the old ways is still attractive, but the future might be in the John Wu 吳志揚 Taoyuan model. As Michael Cole has repeatedly reminded us over the past few years, the Taoyuan government is pursuing an enormous development plan around the airport. However, rather than handing off contracts to lots of small time local cronies, Wu has invited big Chinese investors to come in and fund the project. It is hard to know exactly how the money is then recycled, but it doesn’t take much imagination to speculate that these Chinese investors repay the favor with political influence for Wu’s (or allies’) business dealings in China. This may be simplifying things too much, but it seems to me that the old factional politics that used to be the basis of KMT local power in central and southern Taiwan have simply become much less lucrative. As the money slowed down to a trickle, faction politics were squeezed out by party politics. Since the DPP had always had quite a bit of sympathy bubbling under the surface in the south, once the factions weakened, it was nearly impossible for the KMT to maintain its partisan hold on those local governments. What was left of the factions switched sides and transferred their remaining support to the DPP. In the center where the two parties are much more evenly balanced, the factions have not yet made the same move en masse, but a few people have switched sides. In the north, the DPP had much less support and the factions have not been tempted to change sides. Now in Taoyuan, Wu may have figured out how to marry the traditional construction development state model with the new integration into the Chinese market. This new source of money might allow him and the KMT to maintain and reinforce their coalition of ideological supporters (of whom Taoyuan has always had many) and the watermelon faction who go wherever their economic interests point them. I think when we look back at the 2012 election a decade from now, we might remember this as the year the economic cleavage was introduced to Taiwan’s politics. This is the first year that big businesses have lined up so unanimously on one side. Moreover, there was a real difference in Tsai’s vision of a welfare state with wealth distributed more evenly and Ma’s focus on the traditional numbers like GDP growth. However, if this is the first time the election has been so explicitly framed in terms of a left-right divide, we must remind ourselves that this was not a cross-cutting cleavage. Instead, the new left-right divide was simply layered on top of the China cleavage. The big businesses lined up on the KMT’s side precisely because they want access to the China market. Tsai framed her concern about the growing wealth gap in terms of how integration into the China market affects normal people’s incomes. Maybe in the future, the left-right cleavage will take on a life of its own and cut across the traditional unification-independence axis. If it does, that might upset the KMT’s seeming perpetual majority. For now, I am simply observing the emergence of a left-right cleavage as an important way to decide which side you are on. Many of us were surprised at the size of the KMT’s victory yesterday. This is most likely due to the fact that the DPP did so well in the 2009-2010 local elections, and we assumed that it would at least hold that level of support in this presidential election. It did not. There was a significant retreat in the DPP’s support levels in many big cities and counties. For reference, here is a table with the DPP’s performance in the 2008 presidential election, the 2009/2010 mayoral races, and the 2012 presidential election. Note how well the DPP in the mayoral races in several populous areas, including Taipei City, New Taipei, Taoyuan, Taichung, and Tainan as well as a few more rural areas such as Yunlin, Pingtung, Taitung, Penghu, and Ilan. 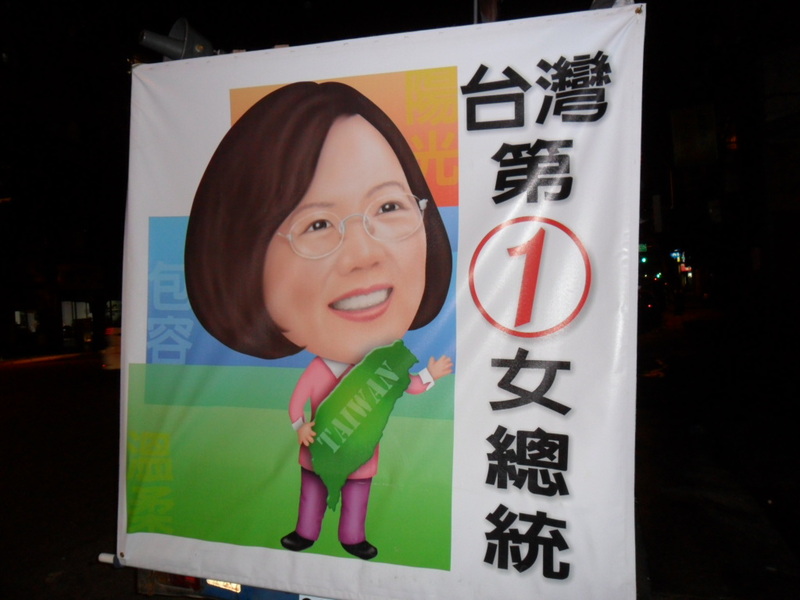 The only places where Tsai clearly beat the mayoral performance were Kaohsiung, Changhua, and Nantou. So what accounts for the drop in the DPP’s fortunes since 2010? I have several plausible answers. This is a question of candidate quality. 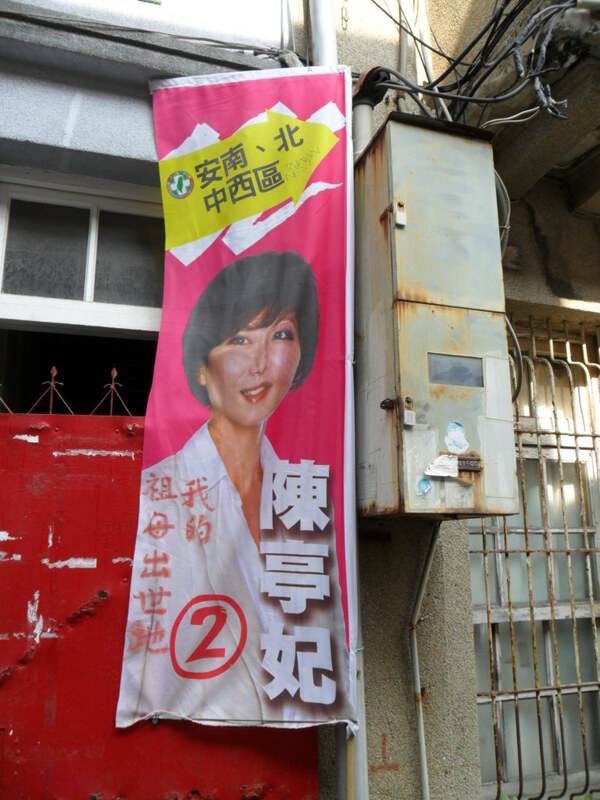 The DPP mayoral candidates were much better than their KMT opponents, but Tsai was not clearly much better than Ma. You can explain a few of these results in terms of candidate quality. The KMT’s candidate in Yunlin was extremely weak, and the DPP faced two very strong opponents in Kaohsiung. However, I don’t think you can make the argument that the DPP’s parachute candidate in Taichung was stronger than the two-term KMT incumbent. Likewise, it is a bit of a stretch to argue that the DPP enjoyed an advantage in candidate quality in Taoyuan. Overall, I don’t think this argument works. This is the difference between local and national elections. In local elections, voters are willing to vote for the DPP. In national elections, they are afraid of the DPP’s cross-straits policies (or some similar explanation). The 2009/2010 elections were effectively midterm elections. The opposition party always does well in midterm elections. The DPP suffered a real decline in popularity (or the KMT gained in popularity) over the past year. Explanations 2-4 are all plausible, and I don’t have any evidence for one or the other. I think it is plausible that the KMT did increase in popularity over the past 12-24 months. In particular, Ma’s first year and a half was a mess. He fooled around with delegating power to KMT elders like Lien Chan and Wu Po-hsiung while he entrusted the government to technocrat Liu Chao-hsuan. Ma arguably found his footing when he realized that the presidency is not a ceremonial post in Taiwan, assumed the KMT’s chair, and appointed a savvy politician (Wu Den-yi) as Premier. In addition, the benefits from ECFA might be starting to kick in. Sorry if you wanted a clear answer. I’m just thinking out loud. Sometimes it is easy to forget how stable Taiwan’s party politics are. This election result reflects that underlying stability. It is hard to move the national vote more than a few percentage points. I previously wrote that even if Ma Ying-jeou won, it would be an ugly win. I was wrong. His 6% win seems like a substantial win, especially when you consider that the blue-green balance is 54-46. This is a little smaller than the 58-42 balance of four years ago, but 54-46 is still a substantial gap, especially since the KMT did not have the advantage of running against an unpopular and discredited incumbent. With a sizeable 70-43 majority in the legislature, Ma Ying-jeou is not going to immediately become a lame duck president. Instead, he probably has enough power to do most of what he wants. He will almost certainly have the power to implement the next stage of ECFA, and it is not out of the question that he could push through the peace agreement that he mentioned during the campaign. Because the blue camp vote was split between Ma and Soong, I am going to look primarily at the green camp vote. Four years ago, Frank Hsieh got 41.6% of the vote. This year, Tsai Ing-wen got 45.6%. The interesting thing is that the DPP’s vote grew just about 4% everywhere, regardless of how much they had four years ago. The only major exception is Taipei City, which has always been the most stable place in Taiwan. 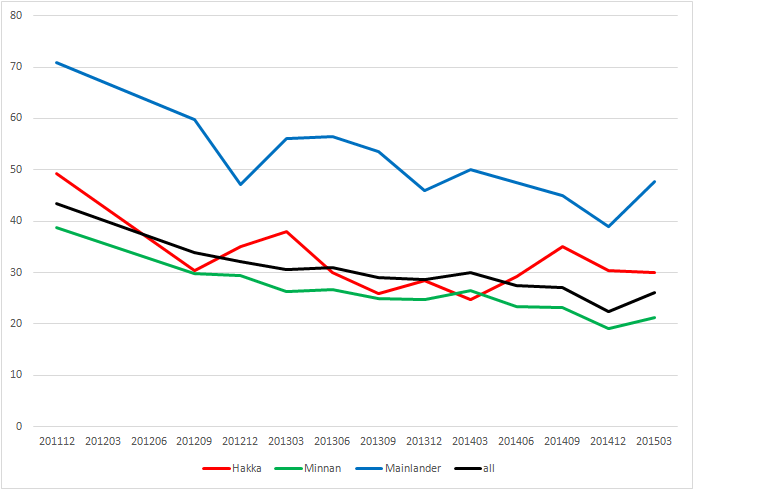 The increase is slightly higher in Tsai’s childhood home of Pingtung and in the northern Hakka areas (Taoyuan, Hsinchu County, and Miaoli), but the difference is not too great. The DPP even increased by nearly 4% in Jinmen and Lianjiang which is particularly startling since this meant that they nearly doubled their previous levels of support. I’m not sure what this nearly uniform increase means, but it certainly is interesting. I had thought that Tsai Ing-wen would run a bit ahead of her party, but this turned out not to be the case. If you take the party list votes and break them into their traditional blue and green components (KMT, PFP, and NP are blue; DPP and TSU are green), the balance is 51.5-43.6, or a 7.9% lead for the blue camp. That is only slightly smaller than the gap in the presidential election. The other parties collectively took about 4.9% of the party list vote. If you really want to apportion their votes to the blue or green camps, I would put the People Party (人民最大黨) and the Green Party in the green camp. The former advocated a pardon for former President Chen, and the latter had a strategic alliance with the DPP in one Taipei district. I’d put all the others in the blue camp. That produces a blue-green balance of 54.0-46.0%. At first glance, it doesn’t look like Tsai Ing-wen was able to take any votes from the other side of the political divide. This presidential election ran along familiar partisan lines. Turning to the 73 single-member districts, the KMT won these by a 46-27 margin. (I am counting the two independents as KMT candidates.) I don’t know the breakdown of party votes for these constituencies yet, but I imagine it is fairly close to the presidential and party list results. This has turned a small blue camp advantage in votes into a sizeable advantage in seats. Four years ago, it was assumed that the new electoral system had given the KMT an almost automatic majority in the legislature, and this election seems to confirm that idea. Even though the election was fairly close, the KMT has easily won a majority. However, I would argue that the DPP came as close to winning a majority in the legislature as it did to winning the presidential election. Let’s do a small thought experiment. Suppose that the DPP had one 1% more of the national vote. Assume that the actual results already contain all the malapportionment and personal votes, so we simply add 1% to the DPP candidates’ votes and subtract 1% from the KMT candidates’. If you do this, the DPP wins 5 additional seats, and the overall result is a 41-32 balance. If we assume that the DPP won 2% more (which was roughly my pre-election guess), add 2 more seats for a 39-34 balance. If the swing is 3% (putting Tsai and Ma in a dead tie), 4 more seats switch and the green camp wins the SMD seats by 35-38. In this scenario, the KMT’s advantage in aboriginal seats would still give the blue camp a slight overall edge in the legislature, but let’s remember that in this scenario, the green camp’s overall vote is still slightly below 50% (at 48.6%), so it isn’t unreasonable that their legislative seats are also slightly below 50%. If you assume the swing is 4% (putting the green camp at nearly 50% of the national vote, the SMD seats go 32-41 for the green camp. This would be a large enough margin to give them a majority even after the KMT wins all the aboriginal seats. In sum, the DPP had to win just about the same number of votes to win the legislature as it did the presidency. It fell short on both counts. Third party candidates did not hurt the KMT in this election. There were nine races that the DPP could have stolen because the KMT’s vote was split by a third party candidate. The KMT only had one opportunity. However, the DPP only succeeded in one of its nine opportunities (Taitung), while the KMT succeeded in its only opportunity (Kaohsiung 9). In five of the eight missed opportunities for the DPP, I am surprised by the DPP’s failure to win. In these cases, if you had told me how much the third party candidate won, I would have confidently predicted a DPP victory. Instead, very weak performances by these five DPP candidates allowed the KMT to hold these five seats. I had thought that with the focus so heavily on the presidential elections, the outcomes in the legislative races would be pulled closer to those in the presidential election. This doesn’t seem to have happened. At first glance, personal votes are still quite important. In fact, with the closer national balance, it looks like personal votes were decisive in a number of elections. Turnout was lower than expected at 74.3%. Most people had expected something in the range of 78-80%. At first glance, it looks like the KMT mobilized their best areas better than the DPP. Turnout is a bit higher in Taipei and New Taipei Cities and a bit lower in Yunlin and Chiayi Counties. This might simply be an urban/rural divide, but I’d bet that turnout worked slightly in the KMT’s favor overall. I don’t think that this was sufficient to swing the overall outcome, but that is unknowable. Finally, as the results of the presidential race slowly solidified, it occurred to me that I have seen this result before with a very similar cast of characters. How is that for similarity in what will probably be the first and last elections of Ma Ying-jeou’s career! One of my favorite definitions of democracy is that democracy is a system in which political parties lose elections. Congratulations. Today the responsibility and honor of shouldering the burden of losing and of making Taiwan a democracy falls to you. It is easy to be a democrat when you win. Everyone likes to win. But democracy is not a system that allows you to win every time. It only gives you an opportunity to try to win each time. Sometimes you will lose. When that happens, you have to accept the loss. You didn’t expect to lose this year. You knew there was a possibility, but, deep down, you thought this year your side would win. So the result was surprising and harder to accept. However, democracy demands that you accept this result. Sure, the other side used all kinds of dirty tricks. They cynically lied when they made campaign promises they knew they wouldn’t be able to keep. They shamelessly used every method to mobilize every last possible vote. They brazenly threatened the voters that if they lost, Taiwan’s future would be jeopardized. None of that matters. The only people who voted in this election were the 18 million eligible Taiwanese citizens. Each one of them had as much right to vote as you, and each one got to make his or her own choice. Some of them made choices based on misinformation, values that you detest, or blatant self-interest, but that is their right. In the end, everyone freely made a decision, and the other side got more support. Of course, this outcome is a disaster for Taiwan. The other side is going to make a lot of terrible policy choices. Your side will do its best to stop the worst ones and water down some of the others, but, because of today’s election result, your side will lose most of these fights. Their policies are going to make real changes and they will have real impacts. Unfortunately, the poor and weak people in society will probably be hurt the most. Their term in power is going to be a disaster for Taiwan. And that is the way it should be. In a democracy, elections have consequences. The citizens get to vote on who will make the decisions, and then society has to live with the results of those choices. This is far better than the alternative, in which there is no way for dissatisfied citizens to affect the government’s choices. One of the great things about democracy is that it is ok to lose. The losers don’t all get beheaded; instead they take up their positions as opposition leaders. The new government can make some decisions, but it isn’t going to be powerful enough to unilaterally and irrevocably determine Taiwan’s future status. The stakes are low enough that it is ok to wait until 2016 and try again then. For today, you’ll probably feel miserable. Just remember that today, your commitment to democracy is being tested, and this is a test you must pass. I’m not sure those jerks on the other side could shoulder this burden, so, in a way, it’s Taiwan’s good fortune that the responsibility of losing has fallen to you this year. Next time, maybe they’ll have to prove that they are as strongly committed to democracy as you are. Here at the end of the campaign, it is time for Frozen Garlic’s Second Annual Best Campaign Flags Award Post. This year has been a fairly miserable year for campaign flags. On the one hand, the campaigns cut down drastically on the number of flags they produced. On the other hand, this year has seen some of the ugliest flags in memory. The color of the year is undoubtedly pink. Traditional party colors took a beating this year, and many candidates tried to soften their look with pink. Personally, I like pink. It’s one of my favorite colors, and I have several pink shirts. However, I don’t like the specific pink and yellow combination that Tsai Ing-wen and many other DPP candidates used this year. It seemed harsh and grating to my eyes. Here is a smattering of pink and yellow. Quick, without looking at the names, can you tell which party these people are from? Interestingly, it was the KMT that tended to go with the traditional blue look. Far fewer DPP candidates went with a traditional party look. This is something new. 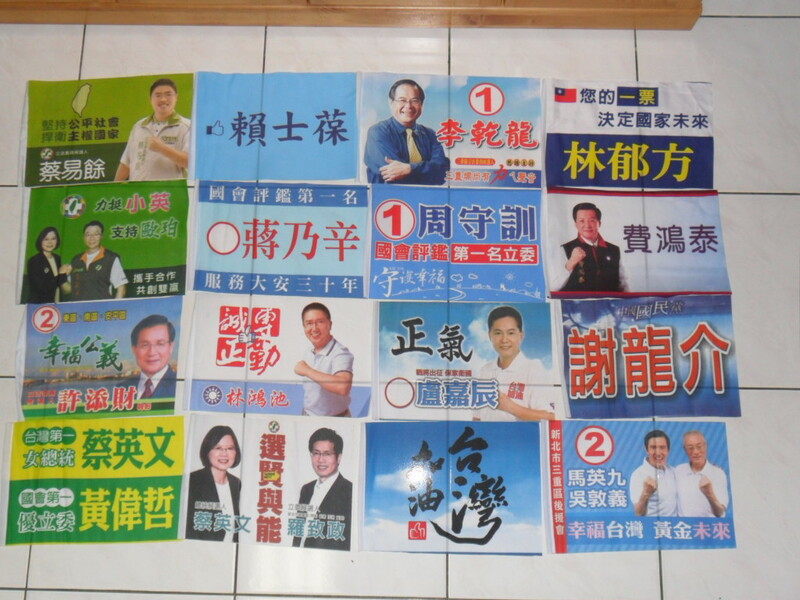 Over the past two decades, numerous observers have pointed out that KMT candidates “ran away” from their party label, not wishing to put the party symbols on their flags. 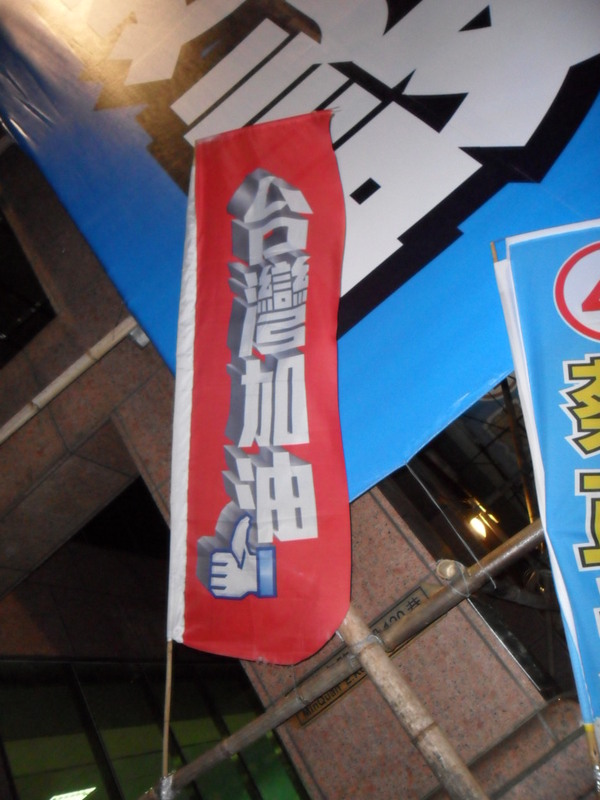 DPP candidates, in contrast, have traditionally put the party logo in a prominent place. Not this year. This year, DPP candidates were more likely to produce pink or yellow flags instead of something instantly recognizable as a DPP party flag. I have argued in the past that KMT supporters should be happy that their candidates didn’t sport the party colors too prominently. That meant that their candidates were appealing to votes beyond the core party supporters. DPP candidates, on the other hand, were generally just trying to consolidate the party’s existing support. Now, it seems the roles have been somewhat reversed. I did see a couple of new things this year. In this flag, the handwritten characters say “My grandmother was born here.” There were about half a dozen of these flags on that street. I’ve never seen flags customized like that for a particular street or neighborhood. I wonder if she put up similar flags in other neighborhoods. 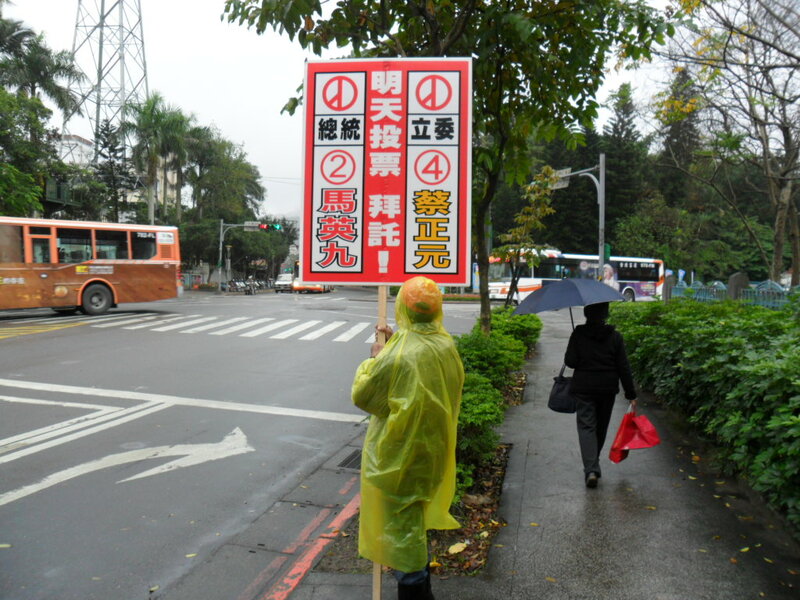 This morning, I saw this guy standing out in the rain with a signboard. Apparently, the politicians are taking a cue from the real estate developers with these sorts of signboards. This is not new this year, but I think it might be unique to Huang Shan-shan. There are posters in business windows all over this district, and they stay up all year round. Business owners generally hate to advertise their political leanings, so these posters are a sign of real support. You occasionally see similar posters for other politicians, but I think the density of these posters is unique to Huang. This looks like a classic DPP ad. Lee Chun-ting poses with Tsai Ing-wen and claims to be the next generation of the DPP. There is just one problem. He is not a DPP nominee. This is from Taipei 7, the district in which the DPP didn’t nominate anyone and is instead supporting the Green Party candidate. I guess Lee decided he would try to win the DPP voters that didn’t want to support the Green Party, which would be a fine strategy if there were 10 seats, not one. If the Tsai campaign had been planning to promote the Grand Coalition idea all along, this should have been their national logo. Note the color combination and the characters (sunlight, tolerance, gentle). This would have been an excellent logo. I only saw it once. 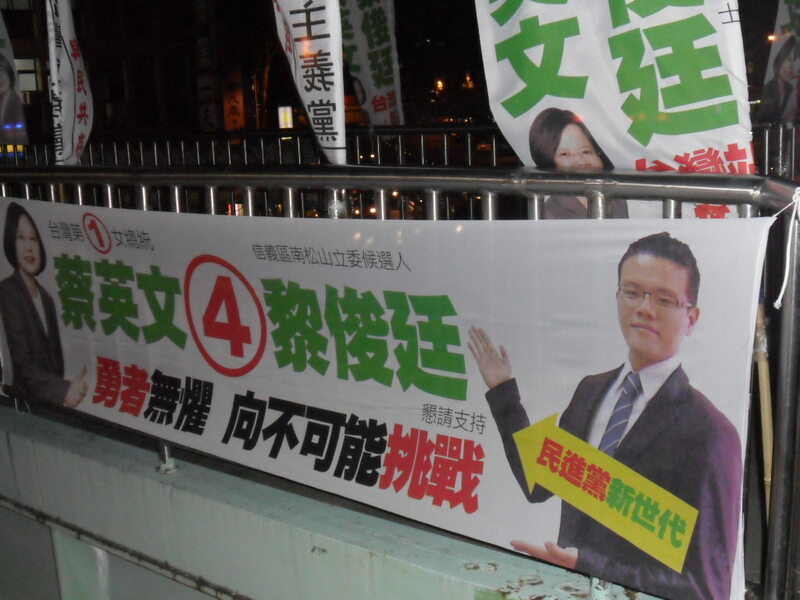 How about this one: The box on the bottom says that this banner for a DPP candidate was paid for by the Three Piggies. The first award: Frozen Garlic’s Worst Ad of the Year goes to local candidate Li Chien-chang. I thought this was an ad for a new movie. You have to look really hard to even see his name. I still have no idea what it means or why I should want to vote for him. Awful. 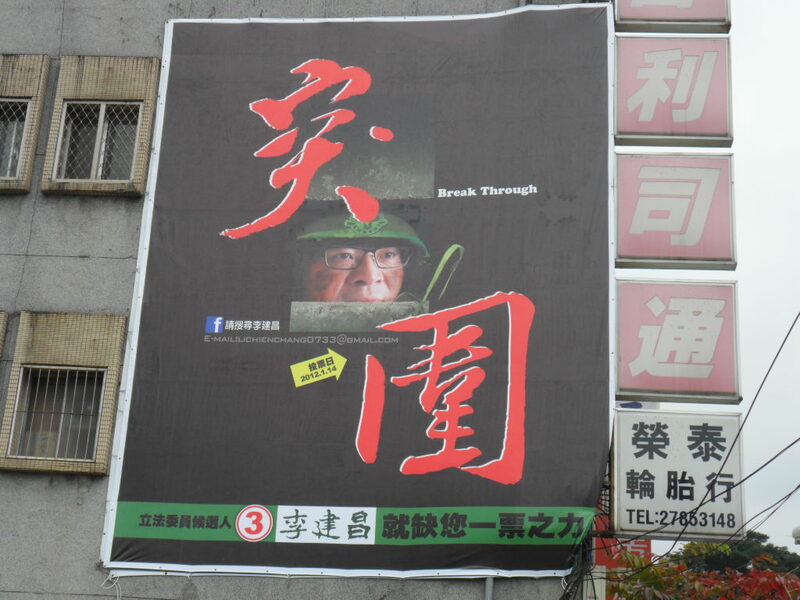 Runner up: The KMT’s Taiwan Go campaign. What the hell does this mean? I think we are all in favor of Taiwan. This is about as useless as the ubiquitous “Taiwan must win” line in many KMT ads. What does it mean for Taiwan to win? Is there some game that I don’t know about? I know what it means for a candidate to win (which is probably what they really want), but not for a whole society. Shallow. In the year of pink, the bottom two are my two favorite pink flags. I suppose I like pink and white much better than pink and yellow. 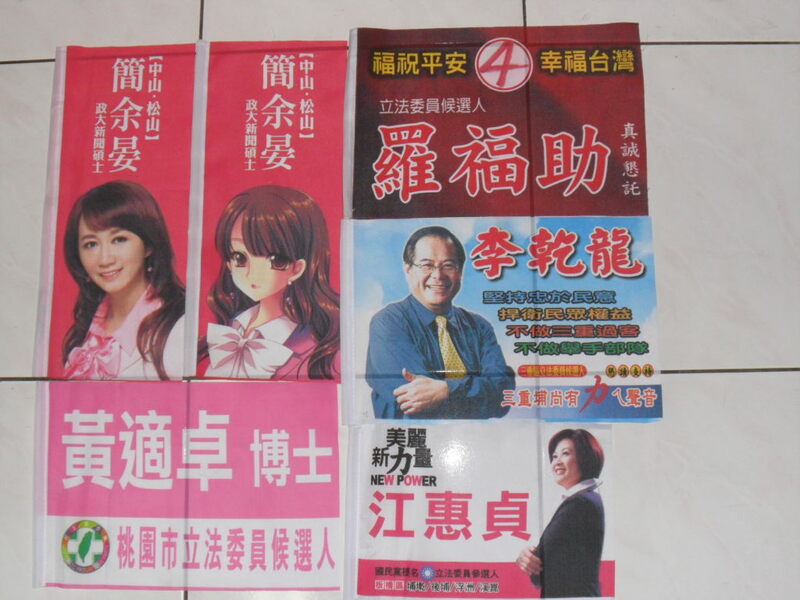 In the upper left, there are two pink flags from Chien Yu-yan, one with her picture and one with her as a Japanese cartoon character (note the same part in her hair and the same bow on her blouse). The upper right flag is from Lo Fu-chu. He wins a nomination because (a) his flag looks good, and (b) I’m terrified of him. My favorite part of this flag is that it has streaks of black running through the red, just in case you forgot about his background. Finally, Lee Chien-lung wins a nomination for one of the best traditional looking flags. If you read the fine print, he even slams his opponent for being an interloper. And the winner is: cartoon Chien Yu-yan! Congratulations on having the best flag in the year of pink! Now all she has to do is beat her opponent Lo Shu-lei, whose flags are (of course!) pink. My impression is that both sides are relatively confident they will win the presidential election. This confidence seems a bit stronger on the blue side. Whatever the result is on Saturday, the losing side is not going to be psychologically prepared. Some people are going to be very upset, and some are going to look for a scapegoat. I was chatting with a good friend about the Taiwanese business voters returning from China. He made one of the smartest points I have heard in a long time. The media is suggesting that somewhere around 180,000 people are being mobilized to return. It is left unsaid that other people might return without being directly mobilized by the KMT, their company, or the PRC. My friend, who is a blue supporter, dismissed these reports. All those people have to come back on airplanes, and there simply aren’t that many airplane seats. He had added up all the airplane seats on flights from China and found that there are only about 40,000 every week. There are some extra flights being added, but those numbers usually included the added flights all the way up to the New Years holiday. Moreover, not all of those 40,000 seats are Taiwanese; some who come back on Monday will return to China by Friday; some won’t vote; some will vote for the DPP. Even if you add in the seats coming from Hong Kong, this picture doesn’t change too much. In short, there will be a lot fewer voters coming back from China than most people are imagining. The plausible numbers probably aren’t big enough to affect the election outcome. I visit a lot of campaign headquarters to collect flags. I’m not great at the soaking and poking method of field research, and this often just involves me going in, asking for a flag, and leaving. Many times, they are too busy to pay much attention to me. Sometimes they treat me like an English opportunity and I leave as fast as I can. Once in a while, I strike up an interesting conversation or learn something interesting. 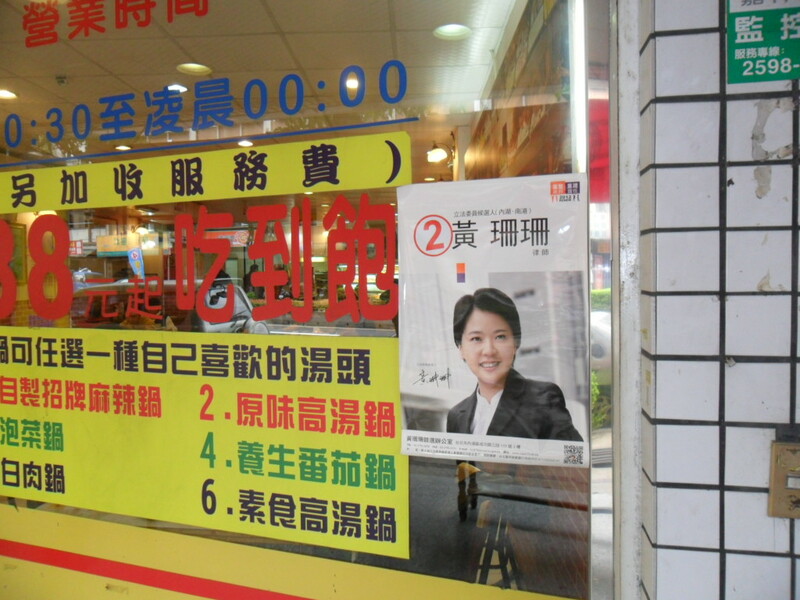 Yesterday, I got two very distinct impressions about the elections in New Taipei 6 and 7 (the two Banqiao districts). D6 is the northern district (which has conventionally and confusingly been labeled the western district even though it is actually more easterly than D7). I went into the KMT candidate’s office, got my flag, and asked the staffer how the race was going. She said it was going well, so I challenged her by suggesting that D6 might be a difficult district for them this year. She looked utterly startled by my suggestion and said, no their race was actually quite easy this year. Now, campaign workers never say this. Even when they are going to win easily, they always tell voters that nothing is sure until the votes are counted and people need to come out to vote. If we have your vote (and the votes of your friends and family), we’ll be all right. This is simply a reflex response for most campaign workers. So I pressed a bit more, asking if Ma would get a majority in the district. At this, she looked knowingly and said, “I don’t know anything about that.” If past results are any indication, Ma probably won’t get a majority in D6 (and I’m pretty sure she expects Tsai to beat him there). However, the KMT candidate is so strong that the campaign workers have no sense of urgency at all. FG conclusion: KMT wins this seat. Then I went south into D7. Judging how a campaign is doing by the morale of the staff is dodgy at best. However, this experience seemed quite telling to me. First, I went to the independent candidate’s headquarters. The candidate and his son were arrested last week for vote buying, and I wondered if that had crushed the campaign. What I found was just the opposite. The office was full of volunteers who met me (and a couple of actual voters who wandered in) with great enthusiasm. They dressed me up in a hat and vest and made me take a picture while everyone laughed. (Hey, look at the goofy foreign monkey!) When I left, one of them chased me to give me the cup of coffee that I had left behind. Wow. If that’s how they deal with all their contacts, that campaign is dynamite. They certainly did not project the air of a defeated campaign that was just counting down the days to their execution. Instead, defeatism was exactly the atmosphere I found in the KMT candidate’s headquarters. When I asked if they were going to win, a question that almost always inspires smiles and affirmative answers, they just gave me a hangdog look and a tired, “We’ll know in three days.” FG conclusion: The independent candidate will split off lots of KMT votes, and the DPP will win. I’m pretty sure this is just about the worst possible way to predict outcomes. This is what will happen! For sure! This is not so much a prediction as a guess. I don’t really believe that social scientists are in the business of prediction in the same way that the natural sciences are. However, it is a lot of fun to guess the future. Taiwanese election results are usually surprising. I expect to be wrong on several of my guesses. So this year I am making three different predictions. First, there is the old traditional guess, which I call “Frozen Garlic’s gut instinct.” The other two are what I think of as the realistic best-case scenarios for the KMT and DPP. I understand that “realistic best-case scenario” is a bit of an oxymoron. The notion here is that these are the most extreme outcomes that I would not find shocking. That doesn’t mean that these are actually the outer limits; I have been shocked quite a few times just in the past two years. On the legislative side, if you add up my gut predictions, you get a narrow blue camp majority. However, I think anything from a big blue camp majority to a narrow green camp majority is quite possible. There is a big range between my two “reasonable extremes,” and that is because of a point I have been making for about a year now. There are a large number of districts that will swing from one party to the other at about the same time the national vote makes the same swing. So if Ma wins by 5%, expect most of these to swing to the KMT. If Tsai wins, expect the DPP to win almost all of these swing districts. Just remember, with roughly 95% certainty, this is all wrong. And if the dam holding the Feitsiu Reservior breaks, we learn that Ma has a solid gold, diamond-encrusted toilet in his unregistered house in Cayman Islands, or Lee Teng-hui dies and is reincarnated as the 15th Dalai Lama before the election, all bets are off. Everyone else wants to guess who will win and how many seats each party will get. Frozen Garlic doesn’t roll that way. Here are the questions in the FG prediction contest. Which party list will get the LEAST votes? Which ticket will get the highest vote percentage? If we get a lot of guesses, I’ll come up with new questions tomorrow. You are currently browsing the archives for the 2012 presidential category.